يحظى فندق كازينو ذا فيل ريزورت بمكان متميز في محور تونزفيل كازينوهات في منطقة منطقة بريكووتر مارينا الفاتنة. يجذب هذا الفندق ذو 4.5 نجوم، والذي يبعد 1 km فقط عن وسط المدينة و 8 km عن المطار، الكثير من الزوار سنوياً. سوف يعشق النزلاء موقع هذا الفندق، فهو قريب من أهم المعالم السياحية في المدينة كمثل جوبيتيرز, Reef HQ Great Barrier Reef Aquarium, مربى ريف اتش كيو المائي . إن الخدمات الممتازة وحسن الضيافة العالي في كازينو ذا فيل ريزورت تجعل إقامتك تجربة لا تنسى. يقدم الفندق واي فاي مجاني في جميع الغرف, أمن على مدار 24 ساعة, خدمة التنظيف يوميًا, خدمة سيارات الأجرة, مجهز لذوي الإحتياجات الخاصة لضمان الراحة القصوى لضيوفه. بالإضافة لهذا,تتضمن كل غرف الضيوف مجموعة واسعة من وسائل الراحة . بعض الغرف توفر حتى شاي مجاني, مناشف, قهوة فورية مجانية, غرفة معيشة منفصلة, تلفزيون بشاشة مسطحة لإرضاء أكثر الضيوف تطلباً. يقدم الفندق مجموعة رائعة من الخدمات كمثل حديقة، لجعل إقامتك تجربة لا تنسى. استمتع بخدمات لا يعلى عليها وعنوان ذو اعتبار في كازينو ذا فيل ريزورت . lovely welcoming and cheerful staff. mentioned we were celebrating an anniversary and had complementary wine waiting in room. lovely view from room. breakfast service was good but cocktails in the evening took forever to arrive. had to cancel order to get to our dinner reservation. Staff in most areas friendly especially the front desk who were very professional and customer focussed. Some staff in the bar of the casino seemed to be a bit slow. We booked a Resort Room, it was a good size, nice and bright with a beautiful view over the water and towards Magnetic Island. Hotel is quite a walk to the city centre but we were happy to eat and drink in the hotel as there was plenty to offer. Fabulous pool with swim up bar. Note: Saturday nights are extremely busy in all areas of the hotel. Staying here was a short term treat. I did not want to participate in any of the casino action downstairs, but it was out of the way enough that it did not distract from the running of the hotel. I did not experience the restaurants but it was an easy walk into the cities mall area. I have been staying at the Jupiters Hotel in Townsville a few time and every time is great. The hotel is located in front of Magnetic Island and if you booked a room in the right side - you will enjoy the beautiful view from your window. The breakfast is great, there are few restaurants. the casino is downstairs and the staff is nice and friendly. It is one of the best options in Townsville. It is the second time I'm staying at the Jupiters in Townsville. This time like the last time was great. The hotel is big, clean and new. There are few restaurants with great food. The breakfast is big and yummy. The view of Magnetic Island from the big window of my room was stunning and I couldn't stop watching it while I was in my room. The Jupiters has nice swimming pool, Jacuzzi and very big garden. If you are into gambling - the Casio is in the 3rd floor. The Juoiters Townsville Hotel is one of the best hotels in town. The location is great - its not in the middle of the CBD so it is quiet and still it is close enough to everything. Since it is located next to the marina, there is beautiful ocean view from the gardens and from most of the rooms. If you like to gamble the Casino is on the lobby level. There are 2 restaurants at the hotel, the rooms are big and clean. I had a great time there. The Jupiters Townsville hotel is a very nice nice place to stay at. It is located in front of Magnetic Island, and very close to the beach and the esplanade. If you book a room with ocean view, you will see every morning The beautiful Magnetic Island. The hotel has a very nice swimming pool, Gym and the casino is on the lobby level. Free parking as well. It is one of the best hotel in town. For the price paid through Agoda this hotel could not be bettered. Whilst the superior rooms are waiting for a refurb, they are very clean, spacious and located on the top floors so wonderful views. The hot water was plentiful, a/c worked a treat in the hot summer, room service was fabulous, staff friendly and efficient. If you do want a refurbed room pay the extra for the deluxe rooms, but for the price on offer for the superior rooms you cannot go wrong. Upon check in we were automatically upgraded then when got to the room my wife qquestioned that it was a deluxe not superior(thinking we had been put into wrong room) I went to desk to question about it and received another upgrade to an executive room - much to out delight, hadn't relised we had been upgraded the first time. We found the room lovely and enjoyed the modern bathroom with its extra deep bath and see through wall. Made our stay enjoyable and relaxing and will stay again if in Townsville. I was disappointed on check in that the information they had printed on my check in form was not mine, totally incorrect also incorrect room fee, which not a concern due to prepayment. Room nice size clean and comfortable,, room changed upon check in from King to 2 queens as King not available on non smoking floor, did not concern me. The Ville staff, facilities,rooms were fantastic. We have stayed in a lot of places in Australia and the service and professionalism from staff is the best Has to be amongst the best Australia has to offer. Thank you. Overall the stay was only for a night but it was great! The room was inexpensive and of a high standard. The casino is a nice touch also! One of the females at reception needs to check her manners on how she address's guests, and that would be my only down side to the visit. But otherwise highly recommended. 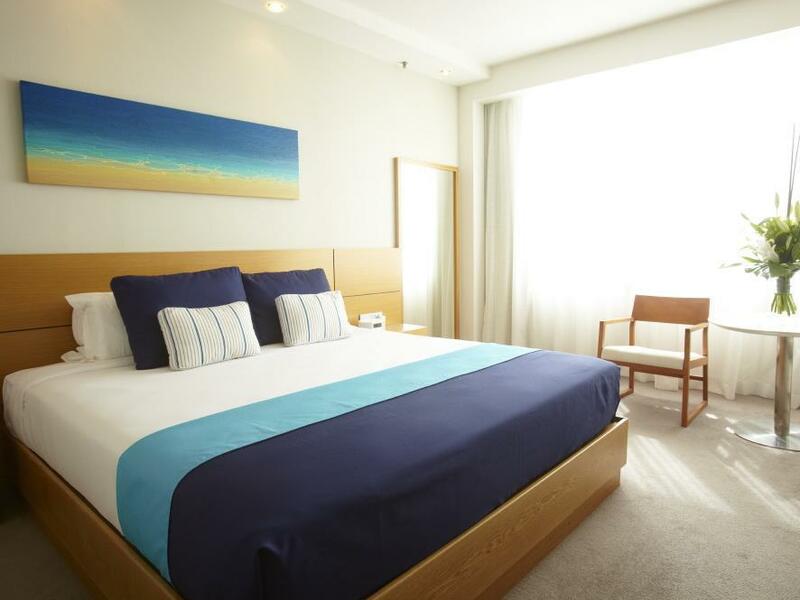 Location is away from Townsville and the Strand, which means it is quiet but if you want to eat or do anything out of the hotel it is a walk or cab ride apart from the ferry terminal to Magnetic Island which is a 2 minute walk. Recommend the Kobe Restaurant for seafood and sides. Had booked 2 rooms with ocean view but when we arrived we were put in rooms that overlooked the roof of a shed. The staff told us it would be an extra $25 to have an ocean view.After calling Agoda (agent) we were upgraded to the room we booked free of charge. Beside that the location is good as is the view. It was a great stay. Everything was excellent. The room was clean and welcoming. the sea view is spectacular. Staff were very helpful and friendly.I would definitely go there if I visit Townsville!! !